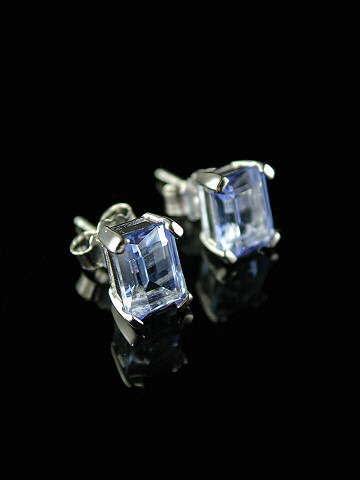 The purity of colour is second to none in these gorgeous emerald-cut Siberian Blue Quartz studs. They're exquisite and sparkle beautifully in the light. Set in rhodium plated 925 sterling silver. This special type of Quartz is lab-grown from natural Quartz crystals, which have been infused with cobalt, giving them their pure blue colour. They are completely flawless. Metaphysically, these stones are said to be powerful carriers of the Blue Ray, which is related to both the throat and third eye chakras. Archangel Michael is Master of the Blue or 1st Ray. The keywords associated with this ray are: Protection, Faith, Will of God, Power, Perfection, Motivation, Courage and Direction. Alongside Archangel Michael, we have El Morya, the Ascended Master of the 1st Ray. He exemplifies the qualities of the Blue Ray; leadership, correct use of personal power, of thought and speech. In gemology terms, 'Siberian' has been used to describe flawless stones of the best quality. We have three identical pairs of these earrings available.